There’s a common refrain that the dense news environment pushes out coverage of mass shootings, but the cycle has been remarkably consistent over the past two decades. A gunman walked into a bar in Thousand Oaks, California, and opened fire last Wednesday night. By the time the gunfire had stopped, 13 people, including the shooter, were dead. It was one tragedy among many in recent weeks, including a shooting at a yoga studio and a massacre at a synagogue in Pittsburgh. Media coverage of these events tends to follow a familiar script. “You do the day story, and then you do the victim stories, and then you profile the shooter,” Erica Goode, a visiting professor at Syracuse University’s Newhouse School of Public Communications, told me. By the next week, in most cases, the news cycle has moved on. 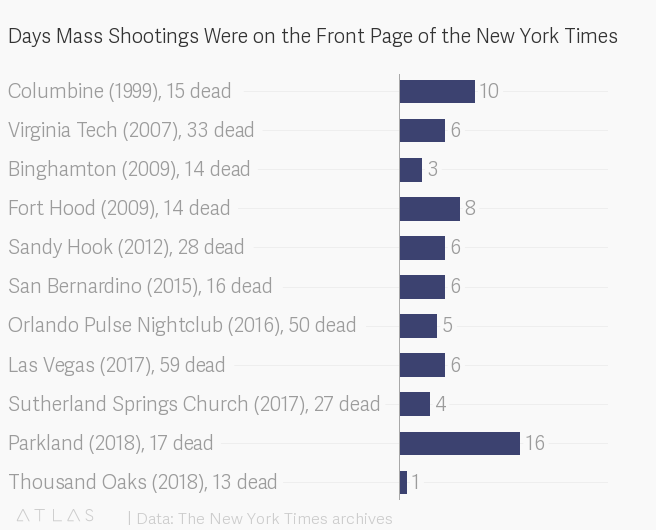 A review of dozens of New York Times front pages in the days immediately after 10 of the deadliest mass shootings since Columbine found that the script is remarkably consistent. Most of the shootings carried the front page for six days, including the Sunday edition. Cable-news coverage—which tends to cycle through news even faster—charts a similar course, according to a report from Media Matters for America. The report found that after the deadliest mass shooting in modern American history, in Las Vegas, major news coverage of the attack lasted a week. That consistency is a reflection of a dense news environment, with more major stories nearly every day than can possibly fit on a front page. The extent of coverage is not solely determined by the number of fatalities. The Thousand Oaks shooting, for example, was only on the front page of the Times for one day, as it was pushed off by the deadliest fires in California history, some of which, it so happened, were also in Thousand Oaks. Those stories have been replaced, at least in print, by stories—both local and national—on gun-law reforms and more stories about the victims. Of course, Goode says, it is news organizations’ duty, by definition, to cover the news—and the identity of the shooter is news. But, she said, it is also imperative to cover the news responsibly. By giving less of a platform to shooters, and focusing more on the victims of the shooting and on solutions to potentially preventing the next one from happening, media organizations might beat back some of the likelihood of another shooting, she believes. The phenomenon Goode’s talking about is known colloquially as a copycat effect, and by researchers who study it as “contagion”: the idea that more media coverage of mass shootings might lead those inclined to commit atrocities to do so. Researchers at Arizona State University led by Sherry Towers, a research professor at the institution, set out to uncover whether or not such an effect existed. For Towers, it was a personal endeavor. Ultimately, researchers found that in high-profile mass shootings, there was a statistically significant contagion effect. “We hypothesize that perhaps widespread media attention plays a role in actually basically informing people who might be at risk of committing one of these acts,” Towers says. Lately there has been a refrain that the increasing pace of the news cycle—and the frequency of mass shootings—means that tragedies aren’t covered as vigorously as they once were. In some cases, as with Thousand Oaks, the pace of the news cycle does push the stories off the front page, but in most cases, they are covered as they always have been: for a week. What has changed isn’t the length of the coverage, but the substance—and for the better.